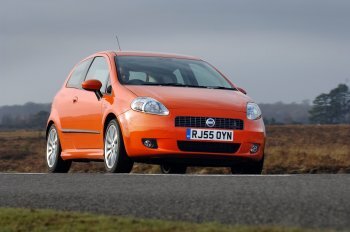 From today Fiat's new 95bhp 1.4-litre 16v petrol engine, which has been christened as the 'Starjet', becomes available for ordering on the Grande Punto range. Available across the trim and equipment specification levels (Dynamic, Emotion and Sport) the new powerplant is fully compliant to EURO4 emission regulations and importantly applies three leading engine technologies to maximise its efficiency in all areas of operation. This new 'Starjet' engine incorporates controlling of port deactivation (PDA,) which operates in conjunction with a variable valve timing (VVT) procedure, and the recycling of the exhaust gases (EGR.) The engine's development focused on the integration of a combustion system with port deactivation resulting in lower fuel consumption, and on attaining a high exhaust gas recovery rate. Deactivation together with high exhaust gas recirculation is used for the new Starjet engine which allows the use of a conventional exhaust after-treatment system and delivers fuel saving and an improved torque and power output characteristics. In order to improve the tolerance of the EGR one of the asymmetric intake ports is deactivated at part load condition to generate high charge motion. The port deactivation allows a more aggressive transient calibration of the engine in the vehicle as well as a fuel consumption optimized engine operation during warm-up using retarded spark timing. 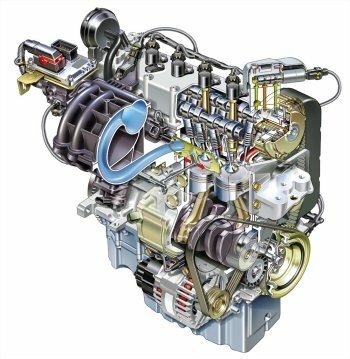 Applying all these strategies, the combustion system with port deactivation, the increasing of the compression ration and the optimization of the friction losses allow a total fuel consumption benefit over current-generation petrol engines. The higher combustion stability allows a leaner mixture during engine’s warm-up up to 6 per cent which contributes to a lower CO2. EGR works by re-circulating used exhaust gases back into the combustion chamber, and mixing them with the incoming gases, diluting the mixture and lowering peak combustion temperatures. It is very important in lowering the engine's Nitrous Oxide (NOx) build up as NOx formation is triggered by the presence of oxygen and high temperatures at around 2,500 degrees. The gases are re-circulated from the exhaust manifold to the inlet manifold via a pipe and their re-entry into the cylinder head is controlled by an EGR valve, which regulates opening and volumes depending on the load conditions. As well as controlling NOx, EGR reduces reduces throttling losses, its lower operating temperature allows more operational energy dissipation to occur, while the combustion chamber surface heat rejection is greatly reduced. The new 1.4 Starjet engine thus maximises efficiency and carefully controls emissions to comply with legislation. Pricing starts at 13,800 euro for the Grande Punto 1.4 16v 95 bhp Dynamic in 3 doors format (14,500 euro for the 5 doors,) 14,900 euro for the 'Emotion' 3 door (15,600 euro for the 5 doors) and 14,600 euro for 1.4 16v 95 bhp Sports (exclusively on the 3 door model.) All the usual features of the Grande Punto model, such as ESP, are part of the package, while a new television advertising campaign, devised by the Leo Burnett Turin agency and directed by Luca Maroni, will promote the Starjet.